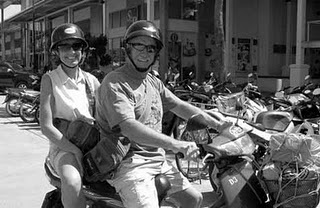 Several years ago, a Canadian buddy of mine, Ken Hagerman, came to Thailand with us for the first time. As we ventured throughout the north country, he fell in love not only with the country, but the people. What better adventures for a people person? Ken returned in mid-October, 2009 with his wife Donna and our travelling group of seven Canadians from British Columbia and Alberta. Sadly on Nov. 1, Ken suffered a massive heart attack and died at Chiang Mai’s Ram Hospital. On our first trip to Thailand in 2004, my wife and I met a very unassuming, but inspiring tour guide Hod Chommala, whom we hired for a four-day family trek in the Chiang Dao area. Every year we’ve reconnected with Hod, always curious and fascinated with how he, his family and others were doing at Mae Pun Deng, a small village about an hour and a half south of Lamphun. If given a choice, Hod would be the stay-at-home farmer, growing crops, improving his land, home, and looking enthusiastically to the village’s future. But he continues work as one of Chiang Mai’s most outstanding tour guides, all while keeping his fellow villagers in mind. One of Mae Pun Deng’s major needs has been clean drinking water. It’s a dilemma Hod and I discussed many times. How can the village’s drinking water sources be improved? What can the villagers do to help themselves? What can outsiders do, without interfering. How can villagers take ownership? The unfortunate death of a best buddy friend ultimately created an overwhelming opportunity. His wife, Donna, knowing the village’s need, initiated the Ken Hagerman Water Project for Mae Pun Deng, with a view to improving the villagers’ drinking water, and as an acknowledgment of Ken and Donna’s love of Thailand. Since that fateful Nov. 1, the stars have been aligned…it’s been a serendipitous whirlwind. We Canadians have known about an innovation of Dr.David Manz of the University of Calgary, Alberta, Canada…the biosand water filter, which makes use of local supplies and workers to provide drinking water 99.999 percent pure. A water biolayer is the key. Simply stated, after a 21-day maturation period, germs in the water eat germs, as the water filters down through the biolayer. Water finally filters through three layers of sand and differently sized gravel. Gravity-fed, it requires no electricity, only the requirement that water be poured into the filter at least once a day, creating approximately 20 litres of pure, clean drinking water with each filling. A quick email outlining our proposal whizzed off from Chiang Mai to the Centre for Affordable Water and Sanitation Technology (CAWST), a Canadian humanitarian, not-for-profit group in Calgary, Alberta. Within 24 hours I was meeting in Chiang Mai with Shauna Curry, P. Eng, CAWST’s Director, International Services and one of her local contacts, Stefan Geiger of the Chiang Mai’s Rain Tree Foundation. She received my email from the Calgary office just after stepping off a plane in Bangkok. It just so happens that Rain Tree ( principals Ralf Oberg, Stefan Geiger and Thomas Singer), manufactures the biosand filter in Doi Saket using local products and labor. It’s a made in Thailand venture. Quickly, we had the Ken Hagerman Water Project on its way, while back in Canada, Ken’s family, friends and colleagues joined Donna in making this project become a financial reality. 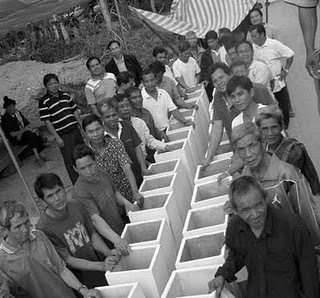 The village of Mae Pun Deng is receiving 250 concrete biosand filters – one for each household, two for each of the schools and two more for each of the village’s temples, and other locations as required. Canadians have contributed approximately 455,000 BHT (about $14,000 CDN) to the Ken Hagerman Water Project. Our latest visit in Thailand is finished…we’re on our long flight back to cold, snowy weather, and friends and Ken’s family in Canada. At the same time, the Ken Hagerman Water Project objectives are being achieved through a co-operative effort among the villagers of Mae Pun Deng, our friend Hod Chommala, village headman Nhan Heun, and Rain Tree’s Oberg, Geiger and Singer, and of course, Donna Hagerman in Canada. Tuesday, Dec. 8, the first 35 filters arrived and were installed at Mae Pun Deng…the monk’s blessing ceremony and a remembrance of Ken Hagerman highlighted an astonishing village celebration between the Farang and their new-found Thai friends. 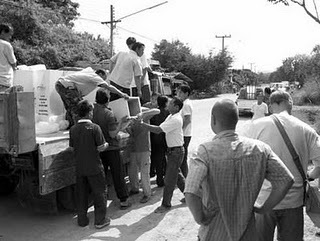 As filters are manufactured, villagers will pitch in and transport them to Mae Pun Deng with their own trucks over the next few weeks…again a co-operative effort that keeps everyone in the village involved in the Ken Hagerman Water Project. Rain Tree, along with installation, is training villagers how to operate and maintain the filters…and with our friend Hod will keep a close eye on the project over the next year. It’s a wonderful tribute to a ‘buddy’ and an awe-inspiring experience, just like so many others we’ve been involved in during our visits to Thailand. Then again, we just wouldn’t expect anything less.